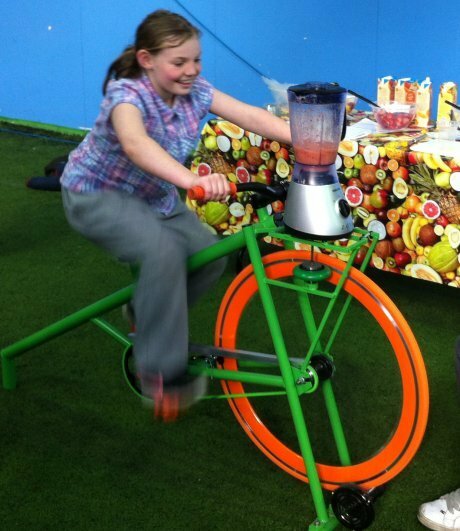 Hire a Smoothie Maker Bike for some environmentally friendly, pedal powered smoothie making fun! How do you make a fruit smoothie even more healthy? Simple, forget the electric and use pedal power to make it! The customer chooses the ingredients to create the smoothie type they prefer, places them into the blender, climbs on to the bike and pedals for a short period. 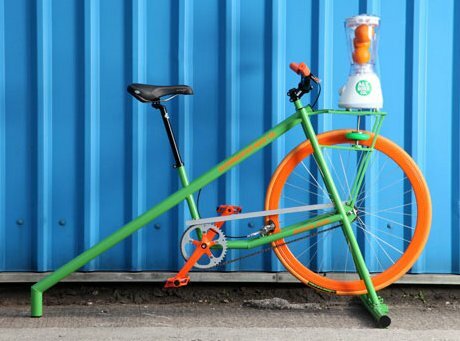 The front wheel of the smoothie bike drives the blender mechanism and after a short period of pedalling you have a tasty smoothie. Healthy food, healthy exercise, environmentally friendly, lots of fun, and a delicious smoothie to drink at the end of it! Our Smoothie Bike is a great attraction for all events but especially those promoting healthy eating, a healthy lifestyle, or green living. The bike has an adjustable saddle that can be highered and lowered in seconds so it's suitable for both kids and adults alike. The Smoothie Bike can be supplied as bike only with you supplying your own ingredients or it can be supplied with everything you need to make and serve fruit smoothies - a great range of fruit, fruit juices, and serving cups. You'll need an overall space of approx 10x8ft for the bike and table of fruit etc. Being pedal powered no power supply is required. For outdoor events we can supply a pop-up gazebo to shelter the equipment from the elements. We offer our Smoothie Bike hire in the Midlands and throughout the UK including Birmingham and the Midlands, Buckinghamshire, Cheshire, Derbyshire, Gloucestershire, Herefordshire, Hertfordshire, Leicestershire, London, Northants, Nottinghamshire, Oxfordshire, Shropshire, Staffordshire, Warwickshire, Worcestershire, Yorkshire. If you have any queries, questions, or would like to book a a Smoothie Bike for your event please call us on the number below or click to enquire and we will do all we can to help.